The recent introduction of ‘Endless Summer’ and several other mop head varieties (H. macrophyllas) that bloom on both old and new wood threw hydrangeaholics into a frenzy. While these new varieties do bloom throughout the summer, the blossom heads are smaller and lack the depth of color of those produced by the old classic ‘Nikko Blue’, the beauties Martha Stewart grew in her Connecticut garden. This Bailey Nurseries introduction is a breakthrough in Hydrangeas because of its ability to flower on new or the current season's wood or growth. Most hydrangeas bloom on last year’s wood. The result is a plant that provides beautiful flowers all summer long. 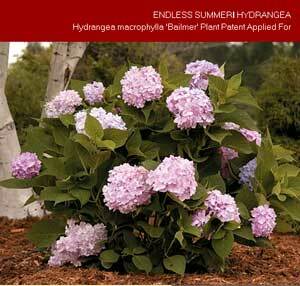 It is unusually hardy compared to other Hydrangea macrophylla, even in a zone 4 climate. The flower grow up to 8" in diameter with pink blooms in alkaline soils and blue blooms in acidic soils. With so much buzz about Endless Summer® Hydrangea, Bailey Nursery decided to build a web site to help answer any questions you may have. Click onto www.endlesssummerblooms.com for a wide variety of information. For a retail source of this plant go to www.baileynursery.com and go to the “Find Our Plants” section. This plant is also being grown by Monrovia Nursery. Go to www.monrovia.com. These plants need to be kept in tiptop condition. 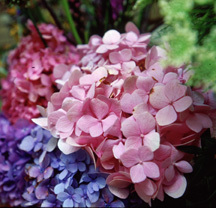 They do best in morning sun, Hydrangeas crave moist, organically rich, well draining soil. So if your hydrangea is plunked under a huge maple tree, move it. Amend soil that lacks organic matter with peat moss, compost, well-aged manure, shredded leaves and/or composted pine bark and mulch the plant with 3 inches of organic material.